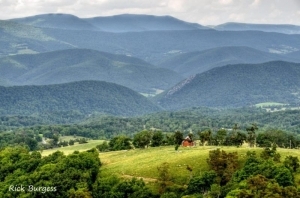 Beaver Lick Mountain, in eastern Greenbrier County, is among the southernmost ridges in the Allegheny Mountains and attains heights of more than 3,000 feet. The mountain is oriented along the southwest-northeast trend of principal mountains in the Alleghenies. Minnehaha Springs erupts at the northern terminus of the mountain.